I run out of pictures so I decided to take a photo of one of the suitcases in my large collection of Louis Vuitton... just joking! 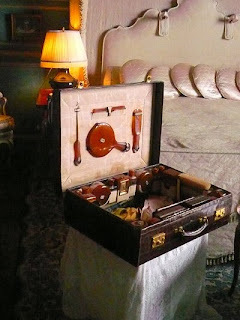 This is a case in the bedroom of Lady Baillie in Leeds Castle. As you can see the room is beautifully decorated. If you ever visit pay particular attention to her bathroom and her very impressive collection of shoes. Nice photo, amazing bedroom and cute post!